Installing mulch, compost and lightweight soils is now a fast and efficient process with Smith Creeks state-of-the-art blower truck. Our custom designed truck features a 300′ hose that can place numerous types of landscape material in hard to reach places without all the hassle of using wheelbarrows or heavy equipment. With our 300′ hose, we won’t leave tracks in your yard, nor do you have to take down fences or playground equipment. We can swiftly navigate obstacles and place landscape products with precision and speed that no other landscape company in Indiana or Kentucky can match. 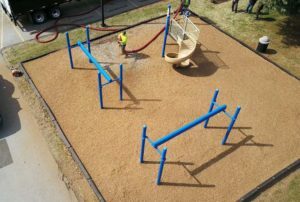 Mulching a playground typically consist of having a large load of mulch delivered and dumped in your parking lot. You unsightly mulch pile may sit around for a few days or weeks until your crew of 5 people has the time to begin installing it. Then, they have to fuel up the skid steer and drive through the grass leaving a mess to be cleaned up later. Skip this entire process and save money, labor and time by going with the Smith Creek option. How Do We Blow in Mulch? Our team pulls up to your site with our truck. The truck can be loaded with up to 80 cubic yards of the IPEMA Certified and ADA Certified playground mulch. We attach our hose to the pump and begin spraying in your material. There is never any dumping of material or romping through your grass with equipment. All playground mulch is pumped through our hose and placed EXACTLY where we intend it to land. The only cleanup we typically have to do is under our truck. Which we take care of. Installing residential and commercial mulch is fast and efficient with our mulch installation crew. We can handle and size landscape material installation fast, efficiently and accurately. Our pump delivers the material at the proper speed to assure no damage is done to plants, shrubs and trees. So say goodbye to wheelbarrows and heavy equipment repeatedly trampling your grass. 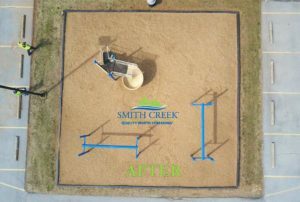 Hire Smith Creek to get your mulch installed without disturbing your existing landscaping. When you have 100’s of properties that need to be done fast and efficiently, call Smith Creek. Our truck can be filled with 80 yards of landscape material which would allow us to possibly service all your properties with just one load. Our professional staff can complete a 20 – 30-yard area in around 2 hours. Hire a mulching company that can get the job done in a single day with just a crew of two. We save you money by cutting our overhead. Doing landscape maintenance on a rooftop garden typically requires loading a wheelbarrow with mulch and heading up a freight elevator. Skip all that process and let Smith Creek tackle your rooftop oasis with their 300′ hose that can be directly scaled up the side of the building. No more using a freight elevator or extra trash from discarded bags of mulch. Our professional mulch blowing team can get the job done when and where you need it. Get your mulch placed in the exact location you need it with no overspray and no damage to trees or shrubs. Our crew can blow large amounts of landscape products in a fraction of the time it takes normal landscaping crews. They can complete a 20 – 30 cubic yard install in a matter of hours. With our state-of-the-art equipment, we can be in and out with our even knowing we were there. We no longer need wheelbarrows or heavy equipment to track through your yard. Just a 300′ hose. Blowing in Mulch can save you time and money. Let Smith Creek show you how blowing in mulch is going to change the way mulch gets installed. Fast and efficient for residential, commercial and playground landscape product installation.